Aloo=Potatoes and Palak=Spinach. As in most Indian recipes the combination of Aloo and Palak is popular all over India, but the taste and flavor will vary immensely from one state to another. 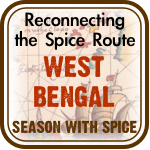 The seasoning, tempering and the spices change in different corners of the country allowing this to be presented in a whole new way. Some places make it rich and creamy, others use coconut or a lot more tomatoes to give it a nice tang. The spices and even the cooking oil will change this recipe to completely new kind. 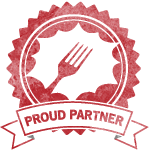 You only have to experience a meal in a few homes to experience the varied taste and flavors. If you are familiar with the Indian restaurants you would know that “Aloo Palak” is a sure thing to appear in the vegetarian part of the menu book – a creamy gooey spinach which tastes darn good as well. If you have ordered one, you will notice that the one that sat on your table would have looked nothing like this. Well this recipe here is a different kind – easy and inexpensive, healthy with no cream, quick and with more homely and comfortable flavors. This is the way I grew up eating my Aloo Palak. Not many spices are used here, the spinach is not overcooked and served with the usual dal/lentils that appear almost at all meals of an Indian family, this becomes a part of a nice healthy meal. If you are using fresh spinach, wash them till the dirt is gone. Tear them into rough pieces. they do not have to be even and uniformly done. Heat oil in a pan. Add the cumin and the red dry chili or the slit hot pepper and let the seeds sizzle and turn brown. Add the garlic and stir them around till light brown and fragrant. Add the onions and cook at medium heat till they start to caramelize/turn brown. Add the potatoes, salt and the turmeric; stir them around the pan so all the spices and onions coat the potatoes. Fry the potatoes for about 2 minutes – till the potato cubes start having a glazed look. Add the grated/finely chopped tomatoes, stir to combine and cover and cook for about 2-3 minutes, at medium heat. Add the spinach, toss everything together & cover the pan. Cook for about 5-8 minutes at medium heat or till the potatoes are cooked through and the spinach is wilted and still kind of bright green, which means they are not all cooked. Now uncover the pan and increase the heat to high. Cook while tossing everything frequently till all the water evaporates and you hear a light sizzle. You will feel that some of the spinach will start to stick at the bottom of the pan. Switch off the heat immediately. Cover the pan and let it sit for a couple of minutes. 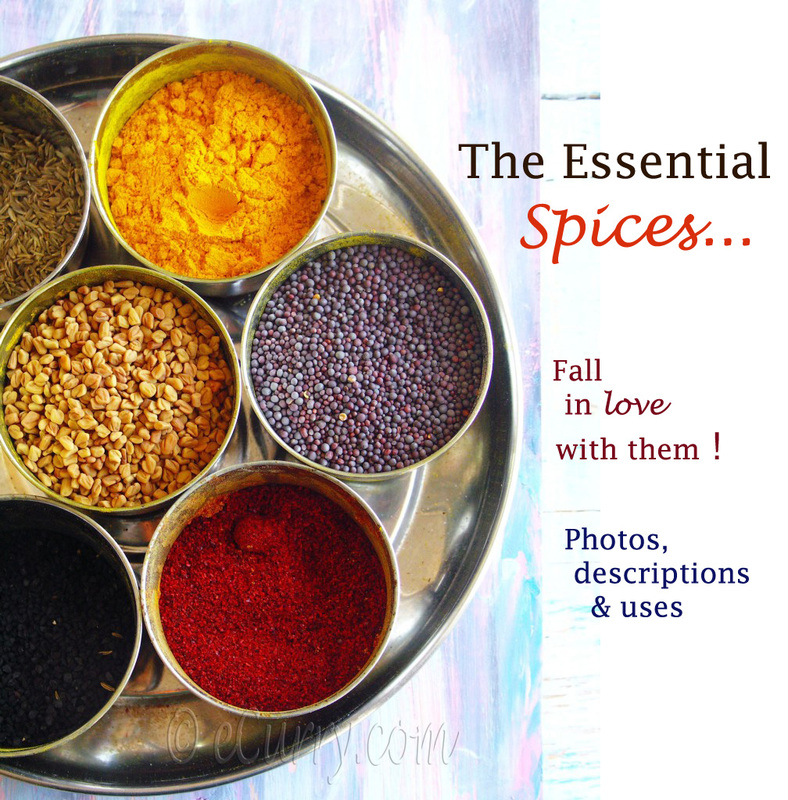 Sprinkle fresh lime/or lemon juice and serve immediately with hot steamed rice or flat bread and dal/lentils. June 16th, 2010 | Category: Dry Fries, Sides & etc. That’s pretty much how I make mine. I think Indian way of cooking veggies makes them so much tastier, than the boiled/ blanched, salt pepper way. i’m so making this dish soon! Look and sound fabulous, Soma! This looks delicious and very healthy. This recipe is new for my palate but not the ingredients. very healthy and delicious. pretty much like the way I prepare alu methi. would be great with rotis. bookmarked. Healthy and delicious recipe. Must try out. 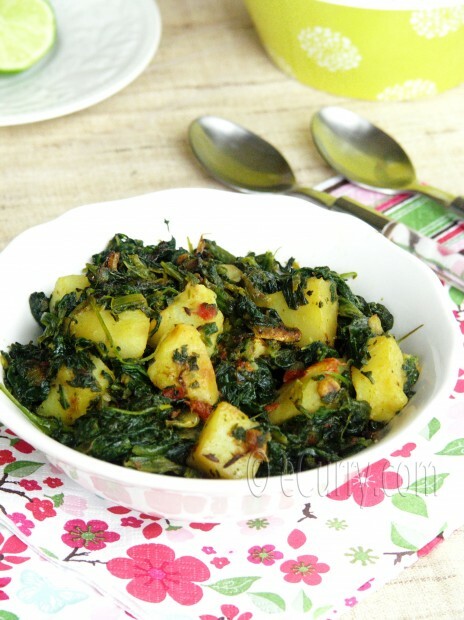 Aloo palak looks realy yumm. I love thiw when i eat in India, but have to say i have neve rmade home. you would be surprised to know how many traditional recipes i haave not made yet. That is a delicious combination! I love both veggies. Wonderfulö flavors. 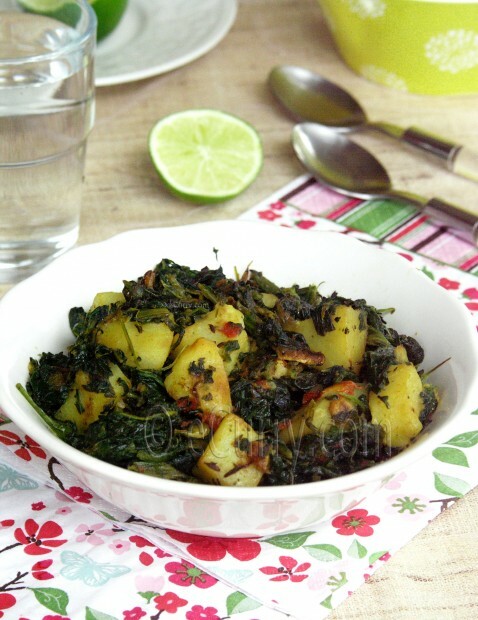 Aloo palak looks delish! A lovely combo! Gorgeous! Love the picture and the dish, perfect for Parathas. Enjoy. Very much a comfort food !!! Good looking bhaji there! !Have not make aloo-palak in ages. I can’t believe I’ve never tried a combination of spinach and potatoes, it sounds so delicious! On my list to try very soon! I’m just happy to have discovered your blog! Your photos are truly beautiful and colorful, I love them! I even substi aloo with gobi! That would be a simple and tasty side dish! Ah now that looks so pleasing, reminds me I havent made aloo palak in long time, with garama garam parathas it would be heavenly! Wow, nice potato dish wish spinach…great combination! 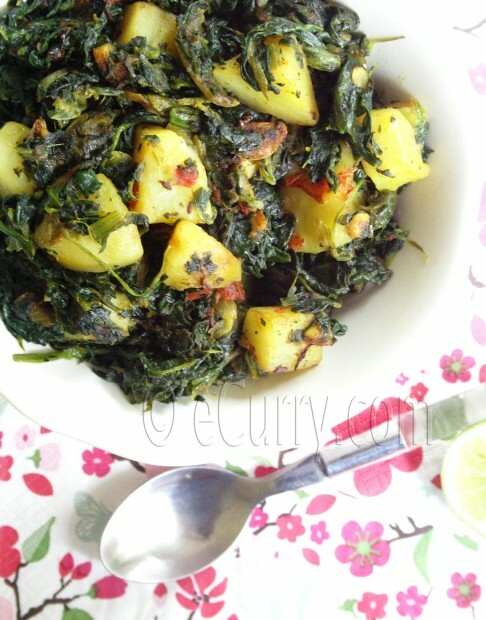 I love this lighter version of aloo palak. 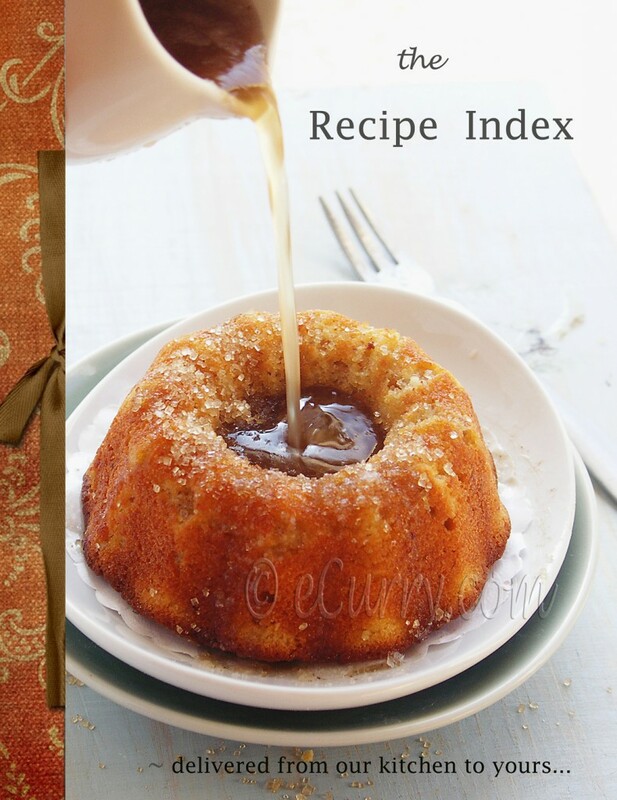 I’m adding this to my list of recipes I can’t wait to try! Wow, such an easy and great looking dish. I’ll have to try this some time in the future with some Pleasoning Seasoning that I get at the local store. What a great recipe! Thanks so much! I love this dish but have actually never made it – thanks for the recipe. I loved this dish!! So simple, healthy, tasty and full of subtle flavors. This reminds me of one of my favorite tarkaris at a nepalese restaurant, which was another pleasant surprise. Thanks for the great recipe!! Thanks a lot! I am from West Bengal and Nepal sits right above it. In Bengal, most of the sides, (mostly the vegetarian ones) are called Tarkari too. I made this dish last night and even though it was very good, I found it to be a bit bland for my taste. Also, there is mention of adding salt and turmeric in the directions, but not in the ingredients. I added about a teaspoonful of curry powder because I didn’t have turmeric. When I make this next time, I will adjust the spices. Overall, it was very tasty, but didn’t entirely satisfy my craving for Indian food, which is not available in the area where I now live. I will have to keep looking and add more things to my repertoire! Thanks for the wonderful recipe. You are right. I had missed the salt and turmeric in the ingredient list. Updated it. Thanks. Sorry it did not live upto your expectations. As I have mentioned in the post, this is not the usual rich dish that is served in the restaurants. This is more the homey kind of Indian recipe we have as a part of the daily meal – light, non spicy and not rich and creamy and greasy. The usual Aloo Palak and the more well known one is the creamy kind or the more popular Palak Paneer (for which I have a recipe in the blog) and this is very unlike it. The charm of these recipes are that you can well adapt as per your taste. Thank you for another fun recipe Soma! I have another ‘restaurant comparison’ to tell you about – but unlike the one from July 11 above – because you know, until I started to cook some curries and mainly recipes from your website, the only place I would ever eat them was at a restaurant!! I don’t have friends who cook curries at home. In any case. I think in your recipe, vs. what I have seen in Indian (I don’t know what region…) restaurants with Aloo Palak, is they put a lot more potato-to-spinach ratio. So I cooked it that way, to suit me, and because I didn’t have flatbread I want more carbs in the dish itself. So I used maybe 1/2 the spinach you call for or even less, like 1/3 the amount of spinach, just under 200 grams (by the #s on the package…I didn’t weigh it I admit). And I used 3 medium potatoes, not 1 large. And the ratio was just right for me. The flavours were perfect to my taste, and I cannot wait to make this for my special someone, who (though we live together) is currently across the country, visiting his family! It will be a nice dish for when he gets back. Thank you again for sharing, and best wishes. Anything that will work for you. 🙂 That is the fun part of cooking, isn’t it? Once you have a base recipe the best way to enjoy it is to experiment differently at different times. wow,nice recipe and its healthy too. Soma, this is very delicious, and I enjoy your writing style, too. 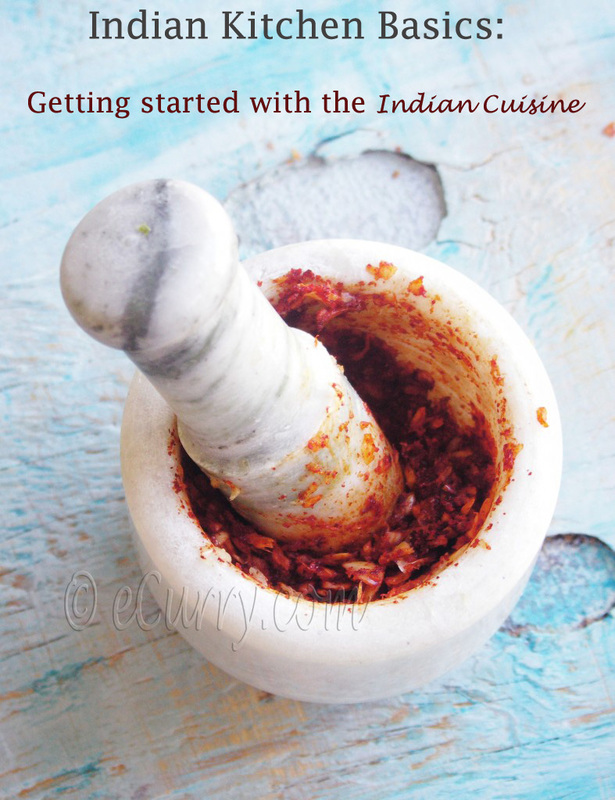 I’ve been looking for a great blog focused on more healthful, homestyle Indian deliciousness, and yours fits the bill perfectly. Thank you so much!